(Nanowerk News) A University of Tokyo research group has successfully measured the spin Hall effect in a superconductor for the first time (Nature Materials, "Quasiparticle-mediated spin Hall effect in a superconductor"). The spin Hall effect is responsible for the conversion of magnetic flow to current flow and has not been thoroughly examined in superconductors. Spintronics, or electronics exploiting electron spin, is a research field that has been attracting growing interest in recent decades. It enables us to transmit and manipulate information with lower energy consumption owing to suppression of the Joule heating effect by using pure spin currents, a flow of electrons’ spin angular momentum without any charge flow. Pure spin currents can be generated and detected via the spin Hall effect (SHE). The amplitude of the SHE depends on the material. A larger SHE indicates more efficient conversion between charge current and spin current, thus many studies have been carried out to discover materials which exhibit a larger SHE. Whereas normal metals such as platinum or tungsten are regarded as promising candidates for obtaining large SHE, little attention has been paid to SHE in superconductors. Professor Otani’s research group in the Institute for Solid State Physics has reported the first observation of SHE in a superconductor. The group prepared a device using niobium nitride, and measured the SHE in the superconducting and normal states. Exploiting the unconventional electronic character of superconductors, the SHE in the superconducting state becomes more than 2,000 times larger than that in the normal state. 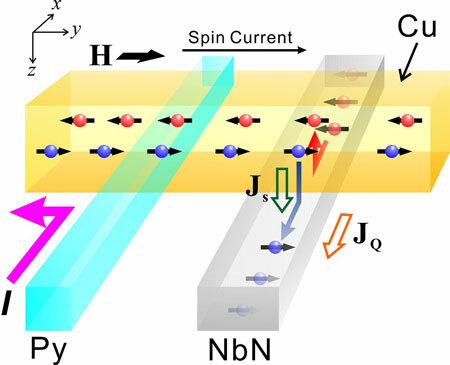 This outcome moves forward on realization of spin logic circuits and future development of superconducting spintronics devices.